With living standards improving substantially, the Chinese people have seen their waistlines expanding rapidly over the past several decades, only to pose serious threats to their health and increase the burden on China's healthcare system. Recent statistics have showed that the average waistline of Chinese urban males has gone from 63.5 cm in 1985 to 76.2 cm in 2012, growing by 20 percent over just 27 years. Among them, those aged between 40 and 50 have an average waistline of 86.2 cm. Protruding bellies and round people of any age are now a common sight in many Chinese cities. As early as 2002, statistics showed that China had 200 million overweight people, 60 million of whom were obese. The Chinese Center for Disease Control and Prevention said that from 1992 to 2002, China's overweight rate went up by nearly 40 percent and its obesity rate almost doubled. Currently, over 80 percent of the Chinese obese population suffers from central obesity, characterized by the so-called "pot belly", said Chen Chaogang, an associate professor from Sun Yat-sen University, "Central obesity could increase the risks at getting diabetes, hypertension, abnormal blood lipids and cardiovascular diseases," Chen said. In 2009, a few global health organizations, including the International Diabetes Federation and the World Heart Federation, called for applying different standards of central obesity to different races. Accordingly, China has set a 90 cm waistline for men and an 80 cm waistline for women as the thresholds of central obesity. Professor Gu Dongfeng from the Chinese Academy of Medical Sciences said that this criterion put nearly 40 million men and 90 million women, all aged between 35 and 74, in the category of high health risks. Matthew Crabbe, co-author of "Fat China: How Expanding Waistlines are Changing a Nation" described China's surging rate of obesity as "a ticking bomb" underneath the country's future economic growth and public healthcare system. In 2003 alone, Chinese overweight and obese adults directly cost the country 21.1 billion yuan (US$3.3 billion) through the means of hypertension, diabetes, coronary heart disease and strokes. Meanwhile, the childhood and adolescent obesity numbers are just as serious in China. Currently, China is still pursuing the one-child policy. Parents and grandparents treat the family's only child as "the little emperor or empress" and gratify the child's every need and wish, with food coming in as the top priority. Indulgent feeding gives rise to childhood obesity. The latest statistics from the Chinese Center for Disease Control and Prevention showed that the number of overweight and obese people below the age of 18 has reached a whopping 120 million. Another recent study by American researchers painted a more alarming picture. The research, published in the Obesity Reviews journal, found that Chinese teenagers' rate of diabetes was four times that of their American peers. Barry Popkin, a leading researcher, said that 1.7 million of Chinese children aged 7 to 18 suffer from diabetes, with another 27.7 million considered pre-diabetic. "In addition, more than one-third of children under age 18 had high levels of at least one cardio metabolic risk factor," he added. Health experts agree that the widespread obesity epidemic is largely caused by radical diet changes and an unhealthy lifestyle. Over the past few decades, Western-style food has gained considerable popularity in China. Western fast food chains like Kentucky Fried Chicken, McDonald's, Pizza Hut and Burger King are very popular among young people with especially children considered as their target customers. The calorie-rich junk food has helped increase their waistlines. At the same time, Chinese adults seem to have abandoned physical exercise. A report issued by the Ministry of Health in August, found that 83.8 percent of adults never take any exercise. Some health experts blame the poor urban planning for this lack of activity among residents. Chen Yuming, a professor from Sun Yat-sen University said: "Unable to find exercise venues nearby, people are inclined to go home and watch TV while enjoying their snacks. This helps to form a hazardous cycle." Chen also noted, "Many people believe that obesity is a result of indulgent feeding. This is not true. Obesity is a social issue." Fortunately, some experts don't think the situation is irreversibly bad. Zhai Yi, a researcher from the Chinese Center for Disease Control and Prevention, said that now is the crucial time for China to prevent obesity from spreading even further. In fact, health authorities and experts have put in considerable efforts to produce diet and nutrition guides, but there is not yet an effective mechanism in place to promote them, Zhai said. Therefore, it is absolutely necessary to enhance the efforts in promoting a healthy diet and lifestyle. Opening a national health TV channel might be a good idea, an expert said. 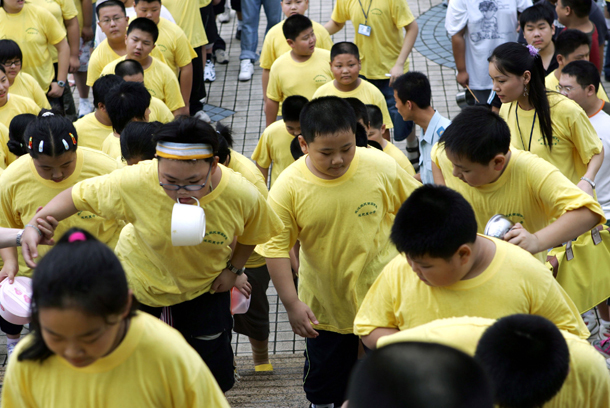 China needs to take action to deal with a growing group of obese people.